If you somehow didn't have enough of the roster shuffles and drama this week, Jonathan 'Loda' Berg has tweeted about an alleged attempt to poach his mid player. OG very recently lost both their offlaner and their captain/position five support when Gustav 's4' Magnusson and Tal 'Fly' Aizik made a surpise move to Evil Geniuses directly after ESL One Birmingham 2018. Alliance have been off the radar for several months. They picked up their current roster in late 2017 and have been labouring behind the scenes, participating in mostly open qualifiers. Their midlaner, who Loda said was the target of the alleged poach, is Micke 'mICKe' Nguyen. The Swedish player made the switch from Heroes of Newerth somewhat recently - back in 2016. I removed my latest tweet because Ive been promised that contracts will be honored. 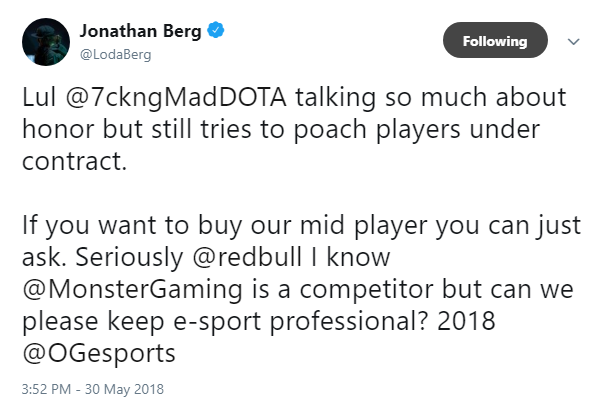 The original tweet has since been deleted, and Loda has posted that someone reached out to him to assure him that any dealings would respect existing contracts. This doesn't mean that a member of Alliance won't end up with OG, but the possibility could still be negotiated. It's likely that OG will try a variety of players before finalizing a roster for TI8 open qualifiers. With just a couple of weeks left in the DPC, many teams are looking to open qualifiers as their strongest chance to make it to TI this year. With absolutely zero chance of getting directly invited, there's little reason to stay together if a slightly stronger roster could be formed for open qualifiers. Open qualifiers kick off June 14th.